From January 1983 to May 1994 the face of oil-painting pedagogy was surmounted by a ginger ‘fro, and the voice of the same was as calm and soothing as bottled Zen. Bob Ross came to PBS to share The Joy of Painting, but what he delivered was a public-television classic and a cultural landmark. 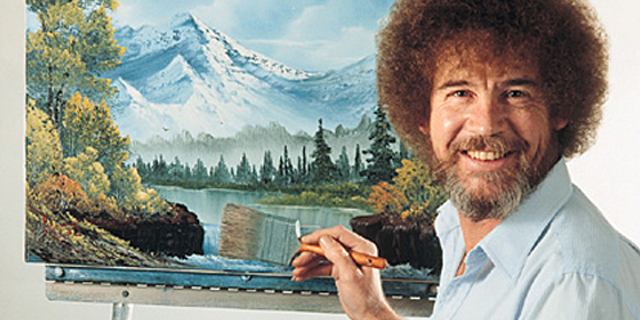 Not to mention innumerable happy little trees. Now let there be rejoicing, because Bob Ross has come to YouTube. Season 1, episode 1 is imbedded below, and every moment of it is awesome to behold—from his low-ball prediction for the series’ run (13 weeks, he says. Ha! ), to his description of his easel, his pallet knife, and indeed every student’s paintings as “almighty.” Bob Ross looked us in the eye, and told us there is an “artist hid in the bottom” of us all. He said all was needed was “a vision in our heart” and the will to put it on canvas. Bob Ross died way too young, aged 52, on the Fourth of July 1995. He is sorely missed, but thanks to the streaming web, he’s surely not forgotten. Bonus Bob Ross funfacts: prior to his art career, Bob Ross was a 20-year Air Force veteran; he retired as a Master Sergeant. He’d started painting during his downtime, and opted to retire when he found that his art sales were outpacing his Air Force salary. It is estimated that Bob Ross completed 30,000 paintings during his lifetime. Roughly four percent of those were donated to PBS stations for fundraising auctions while The Joy of Painting was on the air. What has become of the other 28,000 or so Bob Ross originals? No one knows. This entry was posted in New Post and tagged Art, Bob Ross, happy little trees, PBS, The Joy of Painting, Youtube. Bookmark the permalink.